It seems the news today is filled with issues relating to money - whether it's the crash of stock markets, housing prices and interest rates, or even the thugs currently rioting in the streets of London, stealing off others because they feel they deserve it (don't even get me started on this). What fails to get a mention are the more important things, in particular, the famine in Africa. I'm not one who usually comments about these things, but when I feel that the general public need to step up and give attention to the people who need it most, I'll do something. I want to use this blog as my opportunity to say something, and even if it only encourages one person to donate, then I'll be happy with that. I have put a banner on the side of the blog which with a simple click you can donate. Hey, it might mean that you have to give up buying lunch at work one week - but isn't it worth it? We are so blessed to have the freedom to do what we want, when we want, provide shelter and food for our loved ones, and live a generally comfortable life. I for one couldn't imagine my life without the freedom to eat the food I love, after all, this is why I started this blog. I think it's time to think about those who will never have that freedom, and share something we take for granted. 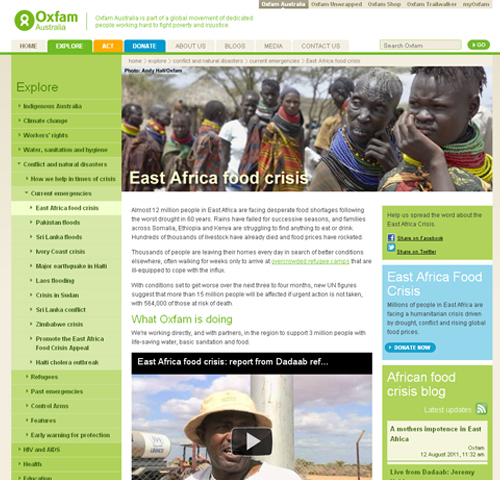 I chose to use Oxfam on my blog, but there are many places you can donate. You can click here for more information. good on ya tash! mad respect!